All eyes are on Ron Singer! In an effort to get to know Mr. Singer a little better we conducted a quick Q&A to better understand our Top Rider. I’m retired with 2 children, 2 stepchildren, 4 grandchildren and 2 step grandchildren with a third on the way. I obviously enjoy biking, and being active, with swimming as my main form of exercise, along with biking. I’m the guy you see daily on a b-cycle (with helmet!). Q2: How long have you been a member of Madison B-cycle? I’ve been a member of b-cycle since day 1, May, 2011. During 2011 I came in second on the leaderboard, last year I was first. Q3: What has been your favorite experience with Madison B-cycle? Doing Tour de B-cycle last year, half with my son and then one year old grandson in tow. I finished the other half the next day. More generally, I enjoy getting around everywhere on B-cycle, seeing others using it, serving as an ambassador of sorts, talking up B-cycle, and helping out people who ask about it, or are having difficulty figuring out how to use it. Q4: If you could go on a Tour de B-cycle with any historical figure (dead or alive) who would it be and why? Probably President Obama. It would be a wonderful way of showing him how programs like B-cycle have not only recreational value, but are part of the solution to our energy and environmental challenges, as well as getting others interested in joining. 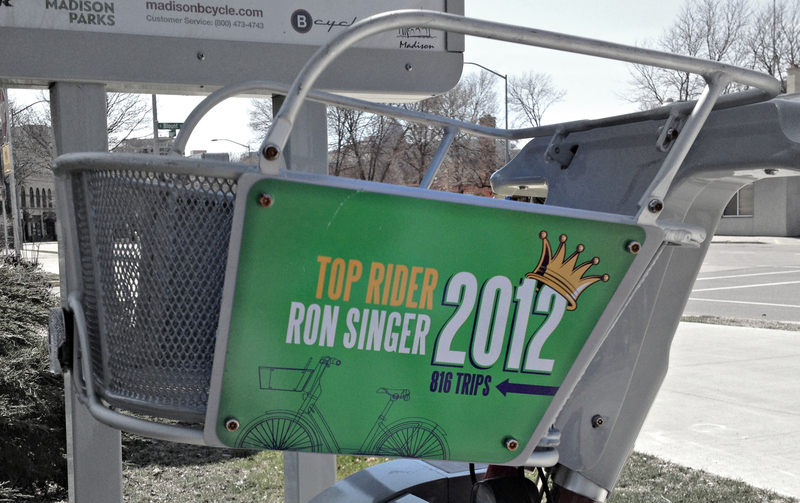 Q5: If there was one thing you could tell a stranger about Madison B-cycle what would it be? Get out and try it, you’ll be hooked – I am!